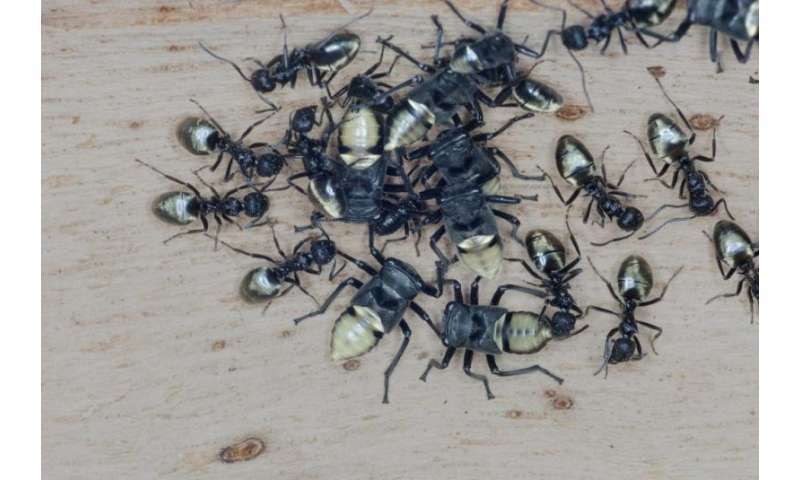 A group of insects that mimic each other in an effective golden sheen to fight predators has been discovered as the largest in Australia, a collaboration between Masaryk University and Macquarie University researchers has found. The researchers discovered a new mimicry complex of more than 140 species that have evolved a distinctive golden sheen to deter predators, which is one of the largest mimicry groups – or complexes – in the world and the largest found in Australia. Animals engage in mimicry to copy signalling characteristics of other animals, particularly to convey that they are not nice to eat, in an effort to avoid predators. The results, published in journal eLife found that what is unique about this system is that each animal in this group displays a vivid golden sheen contrasting against a dark background, and this is proven to be an effective deterrent against predators. "The golden colour is not typically associated with warning colours, but it is not only the distinctive colour that these insects have evolved, it is also the efficiency against predators. Despite the colours being attractive to our eye, for predators they serve as a warning that the thing they are going to attack is difficult to eat or nasty and so the predators avoid it," said lead author Professor Stano Pekar from Masaryk University, in the Czech Republic. The majority of the species in this complex are ants, but the mimics also include wasps, spiders, true bugs, beetles and a group of insects called leafhoppers. "Many animals use bright colours to warn a potential predator that they can defend themselves, and predators often learn to heed such warnings and avoid these animals in future. Wasps, for example, are armed with a harmful sting and advertise this fact through their distinctive yellow and black stripes," said co-author Professor Marie Herberstein from the Department of Biological Sciences at Macquarie University. "Animals that mimic another animal's warning signals can reap the benefit of being left alone by predators even if they are otherwise undefended." To test the efficacy of the golden sheen defence, the researchers analysed the gut contents of 12 species of common, wild predators, including spiders, lizards and birds and found that very few of them ate the golden mimics. "Most of these common predators avoided the mimics regardless of whether they were palatable or unpalatable to eat. Therefore species with this gold colour without defences such as spines and foul-tasting chemicals can benefit by deceiving predators into thinking they are unpalatable," concluded Professor Herberstein.